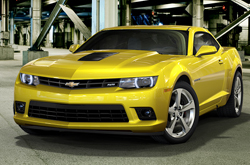 The Chevy Camaro roars into 2015 with a renewed focus on delivering the best balance of style, performance and efficiency. Camaro has been the segment's best seller for four years running. Offering a wide array of trims, from the base LS, to the Z/28 coupe, Camaro's legacy continues into the new era. 2015 Chevrolet Camaro reviews talk largely about its legendary muscle-car heritage, but there is a lot of versatility in this line. Available powertrains range from the 323-HP V-6 packaged with the LS coupe, to the scalding 580-HP supercharged dynamo coiled up under the hood of the ZL1. If you prefer top-down driving, convertible models are available in the LT and SS models. The good news is that this Camaro is designed to quell the steering wheel shake common in other convertibles. Four strategic reinforcements enhance the already-stiff body structure to give the car its coupe-like driving dynamics. If you are checking out the 2015 Chevrolet Camaro in Springfield, take note of the six-way adjustable driver and passenger seats with power recline that are standard on LT and SS models. Leather-trimmed heated seats come with the 2LT and 2SS trim packages. On the Camaro SS models with the six-speed manual transmission, there is an available dual-mode vacuum-actuated exhaust system, similar to those found on the ZL1 and Corvette models. This system provides a quieter driving experience at low engine speeds and an aggressive sound during acceleration. The new Camaro is also jam-packed with safety and crash-avoidance features as well as an abundance of useful technology. Six months of OnStar Directions and Connections service is standard on all Camaros. OnStar service also includes MyLink mobile apps, which offer vehicle information and OnStar services by way of the customer's smartphone. This and other technological innovations are discussed extensively in many 2015 Chevrolet Camaro reviews. With all the different trims and styles, Camaro can be outfitted for every mission from touring car to track star. 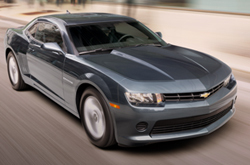 Continue reading our review below, or stop by Reliable Chevrolet to see the 2015 Chevrolet Camaro in Springfield. What are you waiting for? Find your Camaro now! When you compare Chevrolet's new 2015 Camaro next to the 2015 Ford Mustang, Dodge Challenger, Hyundai Genesis Coupe and the Nissan 370Z, we're sure you'll find that the Camaro is the right fit for you. Shoppers will be pleased with the Camaro's superb looks, as well as its cutting-edge features. When compared to the vehicles in its segment, in terms of price it's clearly a spectacular value, making it a popular choice among Chevrolet customers in Springfield. Glance over our Quick List under this text to find out more! 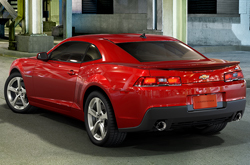 Reliable Chevrolet's professional writers have taken the time to write up reviews of the Chevrolet Camaro and other 2015 models to help make your next car search simpler. As the well-known Chevrolet dealer in Springfield it is our job to provide our customers with reviews transcribed by the most outstanding Chevrolet writers around. Each article is jammed with valuable facts, including info about mpg and more - everything you need to make an sound purchasing decision. If the Camaro isn't a match for you, please review and compare Chevrolets other amazing vehicles now.